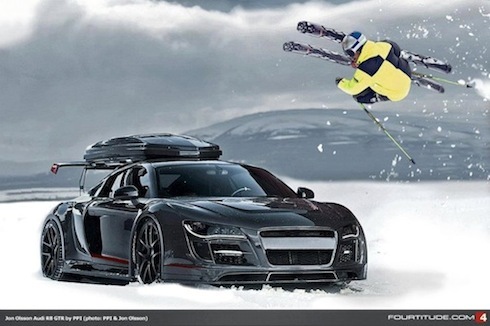 Take what Jon Olsson does on skis, add in an Audi R8, and give it a big dose of PPI Automotive design, and you’ve got one incredible ride. What does Jon Olsson do for kicks when he isn’t on the ski slopes performing a switch double rodeo 1080? He has a garage full of incredible cars that he has fun driving to the events. Jon already has a Rebellion R1k Ultima GTR and a Lamborghini Gallardo in his stable of cars, but since Audi is a major sponsor of Jon Olsson, he asked the German automaker for an R8 for the platform for his special ride. So in order to satisfy his need for speed, he turned to PPI Automotive Design GmbH in Stuttgart Germany, who is an exclusive tuner of Audi Automobiles. PPI took a stock Audi R8 with 10 cylinders, and transformed it into a one-off Razor GTR supercar. They started by removing and replacing every body panel with 600 gram heavy weave Carbon Fiber. Next, they replaced every piece of glass with lightweight racing-grade Makrolon. PPI then took the R8 V-10 and added performance upgrades to pump up the horsepower to well over 600. The German tuning company says the R8 Razor GTR is wider than a Bugatti Veyron and has the same power-to-weight ratio as an R8 LMS race car. The all wheel drive, one-off masterpiece is truly an “extreme winter” supercar and was completely re-engineered to suit Jon’s personal tastes. The custom ski box on top of the car, was one of Olsson’s personal requirements, and features LED lighting and a ski boot warmer that runs off an independent power source. On the way to the slopes, Olsson needs his cars well protected car against the elements, and PPI applied 10 layers of clear coat over the paint and three over the emblems. While that would be over-the-top for most, Olsson takes his cars, regardless of cost, through some extreme European Alps conditions driving in snow and ice. Inside, everything in the R8 Razor GTR is custom made, including lightweight racing seats wrapped in leather, and a specially designed PPI steering wheel, tailored to fit his needs. All the standard aluminum and plastic was also replaced with Alcantara or carbon fiber. Even Jon’s sports logo was incorporated into the seats and carbon fiber threshold plates. The one-off supercar weighs in at a scant 1,320 lbs. and the PPI Design transformation shaves over 550 lbs from the R8′s body. Olsson opted for a set of ADV.1 wheels for each corner of the R8 to finish off the beautiful car. According to PPI, when Olsson took delivery of the Razor GTR, a steady stream of excited expletives flowed from his mouth as he found it too hard to contain.